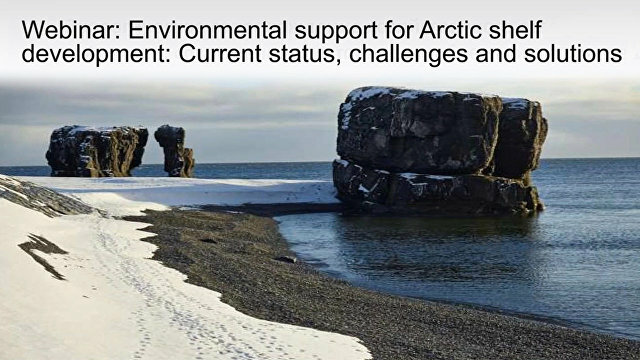 Arctic.ru has held a webinar on providing environmental support for the economic development of the Arctic shelf. Nikolai Shabalin, Executive Director of Moscow State University’s Center for Marine Research, provided clarification on issues related to the possibility of developing the shelf without harming the environment, the environmental support of sea-based technical projects and other challenges, as well as the future of environmental protection. During the webinar Nikolai Shabalin gave a presentation and answered questions. Is ethnological analysis possible during the development of the Arctic shelf? An ethnological analysis is extremely important for the development of any kind of deposit in the Arctic zone abroad, and is quite clearly spelled out in Alaskan and Danish legislation. In Russia, the ethnological analysis as such is promoted by the Association of the Indigenous Peoples of the North. In 2015, ethnological expertise became a legal requirement in Russia as well. Now, it is required to work with the peoples of the north for onshore development, such as if grazing or traditional activity areas come under threat. On the shelf, ethnological expertise is currently not regulated, but it is an important issue, because there are quotas for the production of marine animals for the indigenous peoples, plus shelf operations will adversely affect their fishing and economic activities, especially in the coastal zone. Therefore, in my opinion, the ethnological analysis is necessary. The Gulf of Ob is a case is point. I happened to communicate with the Nenets people, and they say that the fish stocks have fallen in the wake of development. The subsoil users coordinate with them on their land operations, but not their operations at sea. So this issue needs to be raised by the public organizations of the people of the north. When you talked about laidas, you noted that the accumulation of oil would adversely affect the breeding sites of birds, animals, and fish. How will these places be protected? Good question, but there's no answer yet. Spills are mitigated with booms, i.e. special barriers which limit the oil spill area, skimmers to collect the oil, if it happens in the water, and absorbents for a mechanical collection from the surface. If oil reaches the ice or coastal area, only the booms can be used at that point. Getting it out of such places is almost impossible. I believe that oil production in the Arctic is premature, because there is no technology that will allow us to eliminate spills without any harm to the wildlife. Could it be that while we are drafting sensitivity maps, we fail to consider some global changes, such as climate change, increased wave activity, the weakening Gulf Stream, or changes in nature in general? This is a critical issue. Arctic ecosystems are changing fast enough, and many of our findings dating back 20 to 30 years are no longer valid. But it is important to collect data and, speaking of the maps, to build an open information system, which we can adjust once every 12 to 24 months. That is, the maps will be an imperfect tool, but it is easier to adjust an existing picture than to live in chaos not realizing certain patterns. Clearly, the coastline will change, some ice will melt, and the wave load will increase, but nevertheless, for us to be able to evaluate it properly, we need to have a starting point. It is important to create a database and sets of sensitivity maps and have them updated later. What kind of research — space geoecology, remote sensing techniques, geocryology or others — is the most interesting and promising in terms of research? I can speak about the environmental aspect of research, because I'm an environmental expert. I believe that remote research is extremely promising for the global assessment of the processes occurring in the Arctic, because it is only with the help of satellite imagery that we can evaluate the spread of oil spills. The remote monitoring of water areas for information about the primary production and chlorophyll concentration in the upper layers of the water is essential. Remote monitoring holds the future. Remote studies of marine ecosystems, the benthic communities, the use of moorings which would allow us to take measurements throughout the year are important. The biomarker methods, the ecotoxicological studies and bioindication methods are also important, because all of this allows us to obtain information about the Arctic and to learn about the wildlife reaction to contaminants. These methods allow us to improve the quality of environmental assessments and the effectiveness of our forecasts. Developing information systems to collect and interpret data and using software to build patterns may be quite important and interesting. How do you see the mechanisms to control the environment? There are several levels to it. The first level is about monitoring the key points of the Arctic that are important for the functioning of the global marine Arctic ecosystems. If we are monitoring something near Prirazlomnaya, it makes no sense not to monitor the coastal waters of Nenets National Park, because it is a key bird area. Again, if we realize that we have the transport infrastructure for hydrocarbons along the Yamal Peninsula and the Kara Gate, the key bird areas and the distribution sites are sensitive points which should be monitored. In addition, ice holes should be monitored during the winter. This is about monitoring key positions. Also, monitoring in the areas of oil projects and commercial hunting areas using marine expeditions and remote sensing methods. Second, public control. It is important to publish information in open sources, make it available and verifiable, meaning that not only reports but also the raw data should be published. Most importantly, these data could be used for research and for building predictive models. Currently, public hearings have become a kind of a ritual. It's important that the monitoring and the operating results are presented at public hearings on a regular basis, so the public can respond and come up with alternative recommendations. Financial control and legislative monitoring tools are important. All our standards need to be coordinated one way or another with the Convention on Biodiversity and the Convention for the Protection of the Marine Environment so that all of our environmental initiatives and practices become standardized and complementary. The financial control mechanisms should include fines and termination of activities. It's a strong stimulus to promote environmental responsibility.